Squish. Squish. Squish. To you, they're nothing but obstacles, but each one of those Goombas you crushed had a life. Loves. Someone to remember them by. Someone to bury them, pay for a tombstone and mourn for them. 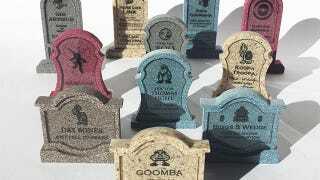 Chinook Crafts sell these fantastic little video game tombstones, commemorating those we've vanquished during our digital travels (or ourselves, if we've screwed up). There's bodies from Mario, Zelda, Final Fantasy, Mega Man and more.